I'm addicted to this series and I'm angry at the Australians. Well, not angry. Jealous. They already have the third book (it doesn't come out in the US until March) and fourth book (I don't even know when this comes out in the US). I'm not allowing myself to look at the reviews for either of these books - it'll be too cruel. One of my issues with this book is the lack of Phoenix. I know he's the "bad guy," but I love him and I want more of him. (He didn't show up in the novel until page 122 and disappeared until 306, with sporadic appearances from then until the end.) When we first see Phoenix he reveals a very interesting connection between Violet and himself - and I LOVE it. I love this plot element that Shirvington throws into the storyline. So perfect. Also, you can tell he still has feelings for Violet - and I think she still has feelings for him as well. Violet mentions there are times when she catches his eyes and can see pain/worry/love, etc in his eyes. I mean, if she doesn't want him, I'll take him. Another thing that annoyed me about the Lincoln-relationship is that he would repeatedly tell Violet that they couldn't be together, but then throw out this little line: "I couldn't go through watching someone else...not again." You either want her or you don't! If you two can't be together that's one thing, but don't throw a tantrum when she gravities toward somebody else. Violet annoyed me in the beginning of the novel. She was so hung up on her feelings for Lincoln and the fact that he was lying again (we know how she feels about lies). I just wanted her to get over him it and do what needs to be done. However, as the book went out she became much more likable and tolerable. As much as her obsession with Lincoln annoyed me, I have to admire her dedication to helping him and protecting him. I also love how he protects her (we see more of this in the later half of the novel than the first half). 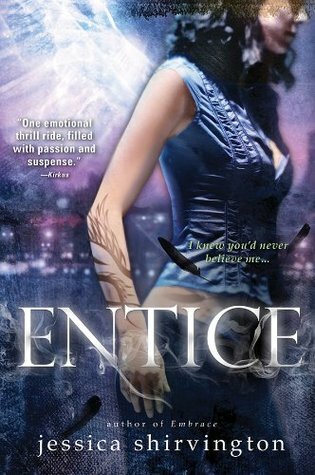 Another thing I liked about Entice verses Embrace is Shirvington focused less on the love triangle (unlike I've done here) and more on the mythology of Angels. She brings in aspects of the Bible and talks about Angels influences on things that have happened here. I loved her idea of the Scriptures and how they got to Earth and what happened to them. This definitely opens the door for the next two books - especially with how she left us hanging at the end: "Interested in a trade... lover?" Oh, Phoneix. Love you! Over all, I loved this book. I love the addition of the new characters, Steph and Griffin can do no wrong FYI, and I really think Shirvington did a better job of going in depth with the old and new characters, especially in her development of Violet's character. I did feel like the beginning dragged a little bit, but the plot elements and story line were definitely necessary for the storyline and influencing what happens in the latter half of the book.